Provenance: I was born in the Bronx in New York City. How long have you lived in Vancouver? I travelled from London, England to Vancouver in the early 1980s and have lived here ever since. I travel as much as I can while maintaining Vancouver as my home base. Occupations: Jerusalem is where I started my theatre career, building sets and stage managing productions. Returning to New York, I sat on the front steps of the New York Shakespeare Festival headquarters until the late Joseph Papp hired me to assist the stage manager. Returning to Jerusalem the following year, I met my husband, got married and performed for the first time. Another big chapter in my life was working and touring the world with the Little Angel Marionette Theatre based in London. Canada was my next home, where I continued to perform and collaborate with local and international artists. A step away from performing I worked full time for six years with Seva Canada, a non-profit agency engaged in eyesight restoration and blindness prevention in the developing world. For more than 30 years I have been the co-director with Wavy Gravy of Camp Winnarainbow, a performing arts summer residency in northern California. I teach, clown, theatre, movement, mask making and performance. Every year I go to San Cristobal de las Casas in Chiapas, Mexico and work with a group called Fortaleza de la Mujer Maya, or Strength of the Mayan Woman. They have their own theatre group and are well known playwrights from Chiapas. Currently I am writing La Bufonada, a rather grand show with a big cast, technological feats and live music. La Bufonada is the culmination of everything I have learned in theatre that can be uniquely expressed with a large ensemble. At 71 this might be my last great project. It will be performed in Chiapas. Passions and Interests: Mixing it up and putting it out in to the world. Whatever it is I am throwing myself into, as I get older I need to throw more gently. Biophysics, botanical marvels and the belief in the beneficial effects of improvisational group work all fill me with wonder and passion. Thoughts on Vancouver? When I first arrived, Vancouver graciously provided me with what I needed in order to continue as a working artist and mother. I received a work permit to run my company, Fools Theatre, on the promise that I would hire Canadians, which I fulfilled over the years. I also landed an apartment in a housing cooperative in Kitsilano, which allowed me to raise my family in an affordable and safe setting. I still live in the co-op. Vancouver is a great walking city, the most stunning city I have been able to explore on foot in my lifetime. As a senior and bus surfer I love Vancouver’s public transportation options. I met Txi through a dear friend of mine when I lived in Kitsilano. Txi’s life reminds me of an amazing tapestry, many strands woven together in vibrant colour, pattern and texture. Her creativity knows no bounds and I am inspired by her vivacity and never-ending curiosity about life. We took some time thinking about what would represent Txi, her past, present and future work. 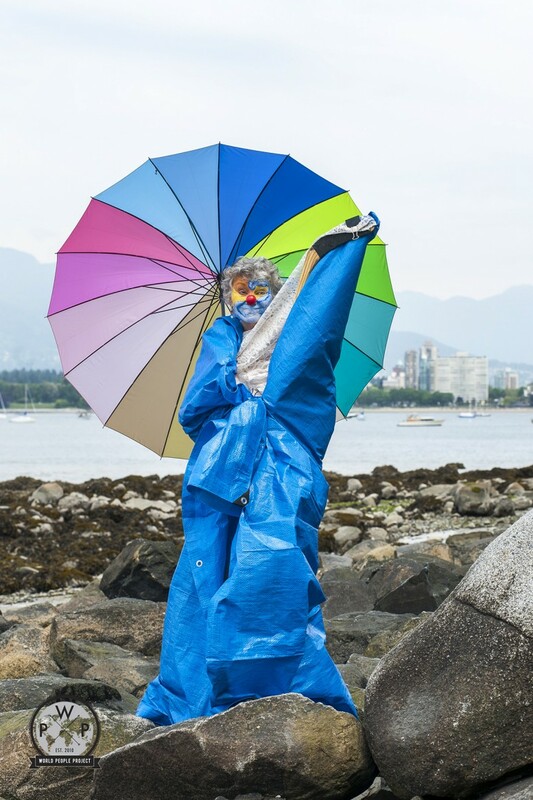 Txi’s portrait was taken at the beach at the foot of Trafalgar Street; the blue tarp is being used in a play that Txi is writing to be performed in Chiapas.